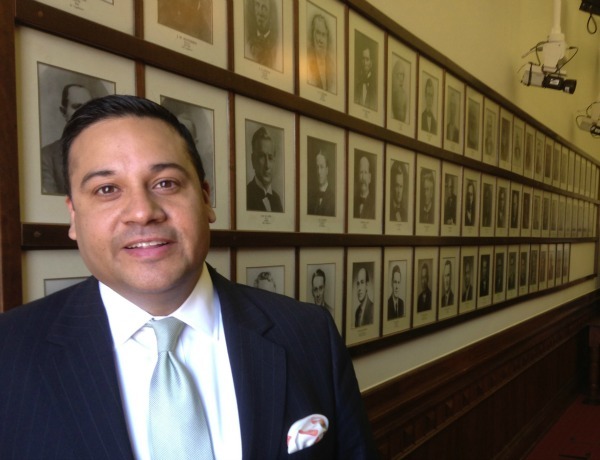 By W. Gardner Selby on Saturday, December 26th, 2015 at 11:59 p.m.
A tweet linking Nazis and Bernie Sanders, posted by Rep. Jason Villalba, R-Dallas, accounted for our No. 1 most-clicked fact check of 2015 (Austin American-Statesman photo, 2015). The PolitiFact Texas fact checks that drew the most clicks through 2015 mostly identified big flaws, some of them accounting for Pants on Fire smoke. Honestly, Rush Limbaugh, Austin banning barbecue restaurants? Then again, a couple of our most-read investigations came out True. Ron Paul, father to the Kentucky presidential hopeful, was right about the costs borne by a Texas county paying for a death-penalty trial while an adviser to Battleground Texas correctly recapped polls suggesting nearly all Americans favor background checks before more gun purchases. What we checked: "Bernie Sanders admits he is a Democratic Socialist. … Nazis were Democratic Socialists." Villalba didn’t back up the statement; we didn’t hear back from him while he told other reporters that not only was the history incorrect in what he posted, he had no intent of linking Sanders and Hitler. We noticed too the tweet was removed later, presumably by Villalba. The fact is Sanders considers himself a democratic socialist, meaning he’d like to see less wealth concentration, national health care and other socialist initiatives. It’s accurate to say Hitler rose to power as a member of the National Socialist German Workers Party. However, that party was all about nationalism and its leaders pushed for an end to democracy and the elimination of whole peoples--and wasn’t socialist like Sanders at all. Our No. 2 most-clicked check of the year tied into our finding incorrect and ridiculous--Pants!--a meme indicating Sen. Ted Cruz of Texas, the Republican presidential candidate who was born in Canada, had just flip-flopped about any president needing to be U.S.-born--intimating that Cruz had previously questioned President Barack Obama’s qualifications to be president amid factually unsupported proclamations that Obama was born in Kenya, not his home state of Hawaii. Cruz had spoken occasionally about his own birth and U.S. citizenship, which he qualified for thanks to his mother being a citizen. Meantime, we spotted no sign of Cruz questioning Obama’s citizenship. Pants on Fire! Cruz--clear about his belief in God and opposition to legalizing gay marriage--hadn’t said anything about there being no place for gays or atheists under the Constitution. Our look into a Cruz claim about how much it costs Americans to figure out and file tax returns landed No. 4 in reader clicks. "Every year we spend roughly $500 billion on tax compliance," Cruz said at a Texas event. "That is roughly the budget of our entire military, entirely wasted on tax compliance." Cruz’s statement proved squishy at both ends; we rated it False. Depending on how you value time, you can get to almost any total for what it costs to prepare and file tax returns--yet most estimates run short of Cruz’s figure. Meantime, military spending exceeded $800 billion at the time Cruz spoke, compared to the military’s base budget of nearly $500 billion. A spending claim by Texan Ron Paul, the former congressman and presidential hopeful, led to our No. 5 most-clicked check. In a commentary, Paul wrote: "Jasper County in Texas raised property taxes by 7 percent in order to pay for" prosecuting "one death penalty case." True, we found, noting that’s what it cost the county in higher taxes to pay for one of three prosecutions after the horrific 1998 dragging death of James Byrd Jr.
Click through below to each of the top 10 most-clicked fact checks of 2015 including one about banning barbecue restaurants in Austin.